It's a great tool (Eclipse plugin) for improving software quality. 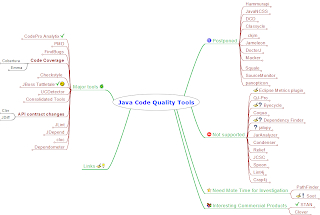 It has the next key features: Code Analysis, JUnit Test Generation, JUnit Test Editor, Similar Code Analysis, Metrics, Code Coverage and Dependency Analysis. It's a free Java tool that calculates the percentage of code accessed by tests. It can be used to identify which parts of your Java program are lacking test coverage. It is based on jcoverage. QALab consolidates data from Checkstyle, PMD, FindBugs and Simian and displays it in one consolidated view. QALab keeps a track of the changes over time, thereby allowing you to see trends over time. You can tell weather the number of violations has increased or decreased - on a per file basis, or for the entire project. It also plots charts of this data. QALab plugs in to maven or ant. Classycle's Analyser analyses the static class and package dependencies in Java applications or libraries. It is especially helpful for finding cyclic dependencies between classes or packages. Classycle is similar to JDepend which does also a dependency analysis but only on the package level. Macker is a build-time architectural rule checking utility for Java developers. It's meant to model the architectural ideals programmers always dream up for their projects, and then break -- it helps keep code clean and consistent. You can tailor a rules file to suit a specific project's structure, or write some general "good practice" rules for your code. Macker doesn't try to shove anybody else's rules down your throat; it's flexible, and writing a rules file is part of the development process for each unique project. Relief provides a new look on Java projects. Relying on our ability to deal with real objects by examining their shape, size or relative place in space it gives a "physical" view on java packages, types and fields and their relationships, making them easier to handle. Lets discuss quickly how we interprete physical properties and how it can help us to grasp project characteristics. JCSC is a powerful tool to check source code against a highly definable coding standard and potential bad code. The standard covers naming conventions for class, interfaces, fields, parameter, ... . Also the structural layout of the type (class/interface) can be defined. Like where to place fields, either before or after the methods and in which order. The order can be defined through the visibility or by type (instance, class, constant). The same is applicable for methods. Each of those rules is highly customizable. Readability is enhanced by defining where to put white spaces in the code and when to use braces. The existence of correct JavaDoc can be enforced and various levels. Apart from that, it finds weaknesses in the the code -- potential bugs -- like empty catch/finally block, switch without default, throwing of type 'Exception', slow code. Spoon is a Java program processor that fully supports Java 5. It provides a complete and fine-grained Java metamodel where any program element (classes, methods, fields, statements, expressions...) can be accessed both for reading and modification. Spoon can be used on validation purpose, to ensure that your programs respect some programming conventions or guidelines, or for program transformation, by using a pure-Java template engine. 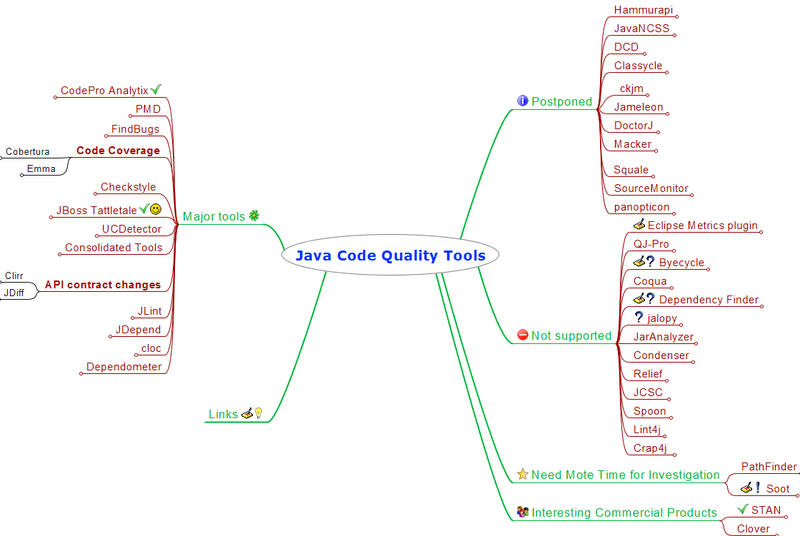 CODERU is a java code quality tool to enforce good design in respect to package dependencies. The CODERU-rules rely on reserved package names and the allowed dependency rules between them expressed in a general way. This list includes open sourced and free tools. I intentionally have excluded commercial tools. I'm sure there are much more tools. In case your know some of them which isn't listed here please add comment to this post.